If you're a fan of motorcycles, you've certainly heard of Indian. In fact, you can actually try to win an Indian motorcycle through the end of September thanks to Dremel. 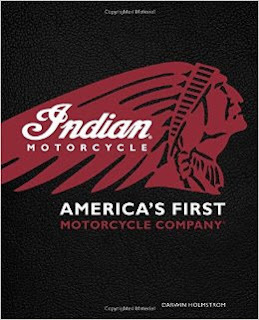 If you're interested in learning about the history of the company, including the recent (2011) purchase by Polaris to reenergize the brand, you can read Darwin Holmstrom's new book Indian Motorcycle: America's First Motorcycle Company. The Indian Motorcycle: America's First Motorcycle Company book is a 200+ page coffee table book that goes into intricate details from the start of the company in America back in 1901 to the latest. About half the book is dedicated to the company's resurrection and the new product line. If you don't mind a few historical inaccuracies... you'll probably like the book's pictures and story. I like the overall vibe of the book and information on the company, I just feel that a book that starts off with such an inaccurate subtitle... If you're a motorcycle enthusiast, you may still like as there are plenty of good parts to the book, just don't believe the first in America part. If you're a true Indian fan, you should already know that. The giveaway will have two winners, each getting their own copy of the book. The giveaway is limited to continental US residents only as I have to do the shipping myself and this is not a light book. It is open through the end of the month 9/30/16 at 11:59pm EDT. You must be 18+ to enter. As always, void where prohibited. Disclosure: I received the above mentioned product for the purpose of this review. No other compensation was received. All opinions stated are my own and may differ from yours. See my disclosure policy for more information. Java John Z's is responsible for sponsor prize shipment. I like the Indian Chief Classic. The Indian Chief Dark horse is a beautiful bike. Indian Chief Classic is an amazing bike love to try them all. I like the Indian Scout.